From the Hancock County Courthouse, go east 2 blocks (0.2 mile) to Boland Street. Turn right on Boland Street (which eventually becomes Linton Rd) and go 11.7 miles to the entrance to the cemetery on the right. 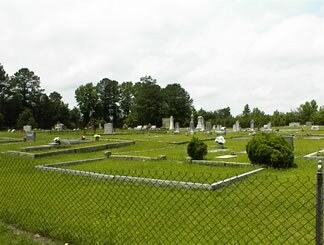 The cemetery is visible from Linton Rd. Rows are lettered starting with the far left (southwest) corner from the main gate off the driveway. Burials that have occurred since the survey and that have not been located are designated in row X.
Beloved father of 16 children, devoted husband. We love you Nana. Only "O." appears as middle initial. Maiden name per Glen Cook. "Sis" Only "A." appears as middle initial. Maiden name per Glen Cook. Resting in peace without pain. On same headstone as Dorothy J. Osborne. No death date as of April, 2003. On same headstone as William E. Osborne. "Ma-Ma" Only "O." appears as middle initial. Maiden name per Glen Cook. m. Lois. Identity and all info per Saleita Boyer Lyons. A large piece of granite represents 7 graves that were at one time marked with wooden markers belonging to the Louge family, per Saleita Lyons, and Thomas and Jack Boyer. Beloved son of Mr. & Mrs James A. Dyer. w/o Jonathan Baker Cone (1825-1862) Georgia Confederate soldier wounded at Yorktown, Va. and buried in Richmond area. A large rock. Most likely a grave. "In memory of our father"
A new grave as of May 2003.
w/o Mirabeau H. Boyer. Devoted wife and loving mother unto her paradise was granted, she kept her faith in God. She was too good, too gentle and fair to dwell in this cold world of care. m. Jul 19, 1855 to Tillie D. d/o W. F. & E. A. Womble. Capt Co. D, 59th Ga. Vol. A brick vault. This lot is surrounded by an iron fence with "Miller" on the gate. Our darling safe in the arms of Jesus. New lot - no one buried here yet. s/o Ivy W. and Susan F. Duggan. "Too pure for earth"
s/o Ivy W. and Sallie C. Duggan. "Gone home"
w/o James Reynolds. A faithful wife, a kind mother and a humble Christian. 3 graves marked with yellow blocks. At rest with God. Only "O." appears as middle initial. Maiden name per Glen Cook. We love you Nanny. w/o J. E. Osborne per Glen Cook. We love you Pa. "Buddy"
She is actually buried at the John Boyer cemetery, per Glen Cook. A most noble example was his life. Dear Father tho we miss you much, we know you rest with God. She was a kind and affectionate wife, a fond mother and a friend to all. b. Hancock County, Ga. d. Macon, Ga.
b. Jefferson County, Ga. d. Hancock County, Ga.
His ways were ways of pleasantness and all his paths were peace. Always smiling and cheerful, her life was filled with concern for others, and great devotion and love of her family. "Mama Boyer" Only "J." appears as middle initial. Maiden name per Glen Cook. Loving husband and a dear friend always had a smile. "My Diddy Our Daddy"
Buried Inverness, Fla. On same marker as Vernissa Adams Reaves and Walter Adams Reaves. "Mother" On same marker as W. L. Reaves and Walter Adams Reaves. 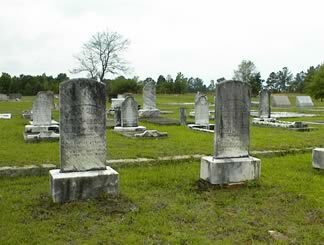 Buried McRae, Ga. On same marker as W. L. Reaves and Vernissa Adams Reaves. Wherever she lived, she loved, and that is Christ. We loved him well, but God loved him better. She was the joy and sunshine of our home, Brightening the whole way onward and upward. Veteran of WWI written on slab. "Sister". d/o W. B. and J. T. Harrison. Mother, thou hast from us flown to the regions far above, We to thee erect this stone consecrated by our love. In memory of our father. Not on this stone but in the hearts of thy friends is thy worth recorded. d/o W. B. and J. T. Harrison. w/o W. B. Harrison. The Master called her, she was ready. He fought a good fight, he kept the faith. s/o W. B. and J. T. Harrison. s/o J. T. and G. D. Trawick. d/o J. T. and G. D. Trawick. A seeker and teacher of truth. d/o J. M. and M. Stanley. Sleep so dearest child and take thy rest. God calls thee home, He thinks best. "Daddy" Only "L." appears as middle initial. Middle name per Glen Cook. "Mama". Full name: Rubydell Inez Miller Osborne, per Glen Cook. "Skeebo". Lay me down to sleep. Only "W." appears as first initial. First name per Glen Cook. s/o R. G. and Buena Vista Stone. w/o R. G. Stone. b. Washington County, Ga. d. Milledgeville, Ga.
Co. K, 7th Ga. Cav. Birth and death dates per obituary (died Johnson Co.) On east side of large marker. On east side of large marker. On west side of large marker. h/o Charity King. Kind father of love / Thou art gone to thy rest / Forever to bask 'mid the joys of the blest. d/o Uriah and Charity King. Let our Father's will be done. She shines in endless day. w/o Uriah King. Rest mother, rest in quiet sleep / While loved ones in sorrow o'er thee weep. He was faithful to every duty. She left to us noble examples of fine Christian womanhood. World War I veteran written on slab. Only "H." appears as middle initial and only years appear on grave. Middle name, dates per Glen Cook. Only years appear on grave. Dates per Glen Cook. No dates. A metal marker. Lizzie Scott's father, per Newt Boyer and Saleita Lyons. Marked with yellow block. Lizzie Scott's mother, per Newt Boyer and Saleita Lyons. Marked with yellow block. w/o George W. Osborne. All info per Glen Cook. Marked with yellow block. All info from Newt Boyer and Saleita Lyons. Marked with yellow block. Identity per Newt Boyer and Saleita Lyons. Marked with yellow block. Only "T." appears as middle intial. Middle name per Glen Cook. Only "I." appears as middle initial. Middle name per Glen Cook. "Sr." also per G. Cook. "Daddy"
"Mama" "In loving memory of Nannie". No maiden name appears. Maiden name per Glen Cook. "Daddy" No middle name appears. Middle name per Glen Cook. "Mother" "Gilmore" does not appear on grave. "Gilmore" per Glen Cook. Only "H." appears as first initial. Nickname, maiden name not on grave. "Harriett (Sally) Hitchcock" per Glen Cook. Only "R." appears as middle initial. Middle name per Glen Cook. w/o W. F. Osborne. "Ma" "Home in heaven" Only "B." appears as maiden name. Maiden name and "w/o W. F. Osborne" per Glen Cook. "Daddy" "Asleep with Jesus". No middle name appears. Middle name per Glen Cook. Ga. S1 USNR. Service written on slab. War service written on slab. w/o Henry W. Thompson, Jr. On same gravestone as for Henry W. Thompson. Buried in Oak Ridge Cemetery, Inverness, Fl. On same gravestone as Lucy T. Thompson. New grave. Info per Macon Telegraph. "PaPa" Masonic emblem on grave. On same gravestone as Maude Pound Hitchcock. "MaMa" On same gravestone as Walter D. Hitchcock. Twin of Lee and Lizzie Osborne. All info per Glen Cook. Middle name, dates per Glen Cook. Only Sidney Osborne handwritten on slab. w/o Sidney Osborne, per Glen Cook. Only "M." appears as maiden name. Maiden per Glen Cook. No dates on gravestone. Dates per Glen Cook. w/o Jasper Boyer. All info per Glen Cook. "Mother" w/o Lester Cook, per Glen Cook. Only "H." appears as middle initial. Only years appear for birth and death. Middle name and full dates per Glen Cook. Actually buried at Horeb church, per Glen Cook. Ga. PFC 1942 Svc Comd Unit. "Papa". Middle name "Eliza" per Glen Cook. w/o Lindsey Osborne. Is buried between Adam Osborne's and E. R. Osborne's lot (in the walkway), and above Charlie and Jimmy Ray Osborne's lot, per Glen Cook. c/o Charlie and Lizzie Osborne. All info per Roger Osborne. All info per Roger Osborne. Age 3 months 13 days. A handwritten slab that is difficult to read. w/o F. S. Boyer, m/o Morris S. Boyer and Alice Gay B. Williams. No death date as of May, 2003. Nickname "J. T." per Glen Cook. Army 483rd Bat HQ Co.
w/o H. D. Boyer. "Mama"
m. Alice Blankenship. Name and marriage per Mack and Eleanor Blankenship and notes taken from Ms. Willie Osborne. Only "H." as middle initial. Middle name per Glen Cook. Co. B, 22 Ga. Inf. No maiden name appears. Maiden name per Glen Cook. Only "H." appears as first initial. First name per Glen Cook. Only "O." appears as maiden name. Maiden name per Glen Cook. Grave not found in 2003. All info per Kimbrough list, which listed graves of 2nd Darien and Linton under Linton only. This grave may be in either cemetery. Located somewhere in the cemetery. Buried after cemetery was surveyed. Husband of Betty Osborne Beverly per obituary. Located somewhere in the cemetery. Buried after cemetery was surveyed. No death date as of 2017. Headstone connected to William Daniel McCoy. "Billy". Located somewhere in the cemetery. Buried after cemetery was surveyed.